The Clintons are perhaps the most corrupt political family in American history. The Bushes may be second, but even they maintained a certain decorum in the White House. Neither Bush president would think of cussing out a secret service man or angrily hurl a White House antique at a spouse. The Clintons are at heart common grifters. They’re lying, vulgar confidence tricksters who continue to enjoy pushing the criminal envelope because they’re used to getting away with their crimes. Both should be in prison. Right now. They get away with their sordid deeds because they have the backing of powerful figures such as Soros and the Rothschilds. The mainstream media are owned by a handful of big corporations, which back Hillary. The central bankers back Hillary. Some of the most leading and influential companies such as Google and Amazon back Hillary. Yahoo backs Hillary. Monsanto backs Hillary. Twitter backs Hillary. Zuckerberg is hedging his bets, but another Facebook founder gave $20 million to Hillary. The Saudis back Hillary and have also given her many millions of dollars. Saudi Arabia is a country that chops off heads, throws gays off buildings and are incredibly abusive towards women. Hillary welcomes their support and money. I can almost hear her say, "Ya know, it’s all about the dough—what difference does it make where it comes from?" In short, the elite back Hillary. Most of them want globalism and open borders for America. They want endless immigration—especially Muslim immigration. Many will not integrate because their religion demands Sharia Law above all other systems. They won’t want to follow our Constitution. Soros knows this. He wants to promote division and strife to bring down our society to help usher in globalism—with his ilk running the show, of course. 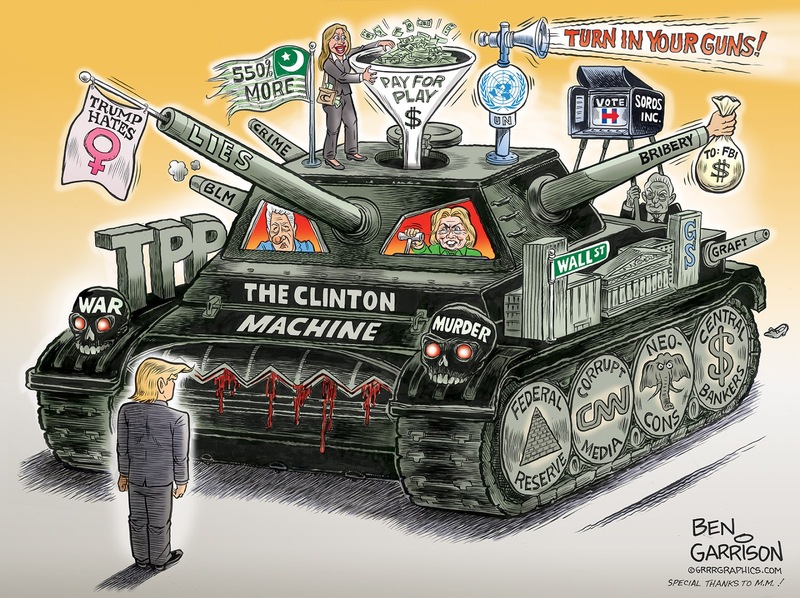 The 1/10th of 1 percent at the top of the pyramid helps allow The Clinton Machine to continue chuggin’ along and doing what it does--breaking the law as a matter of course. Hillary knows she is above the law. Anyone can see the contempt she has for us all—it’s in her eyes. That’s why very few attend her pathetic rallies. Most people know it’s all fake. She’ll say whatever it takes to get elected and then she’ll carry out what she and the elite want. It may be hard to imagine, but she will be even worse than Obama. There will be more opacity and abuse aimed at truth tellers and whistleblowers. There will be more police state encroachment on citizens. More false flags to get us to turn in our guns. Worst of all, more war. 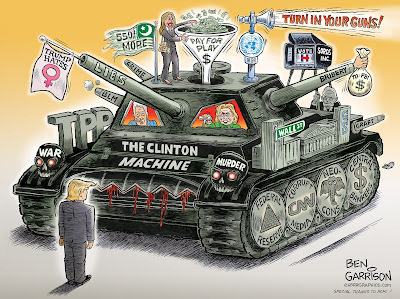 Hillary loves war. Standing up against The Clinton Machine is Donald Trump. He’s a flawed human being like the rest of us, but at this juncture in history he’s the only one capable of standing up to the Clinton Machine. He gave up his risk-free, lavish lifestyle to take them on. He’s had to face assassination threats as well as a parade of insults and false accusations. Why would he subject himself to the Clinton meat grinder? Because he really does want to make America great again. Right now, he’s the only one who can stand up against The Clinton Machine. We need to stand up for Trump.